Reflexology is a holistic energy-based therapy, working through the channels of the nervous, electrical, chemical, and magnetic systems of your body. Unique manual pressure-point techniques are applied to reflex maps on the feet and hands which correspond to every part, gland and organ in the body. Stimulation of these reflexes creates physiological changes in your body, relaxes tension, improves circulation, and promotes natural functioning of the related areas. The soles of the feet are remarkable at absorbing Essential oils, often used during treatments. Reflexology is a respected and effective healing art based on the premise that energy pathways circulate throughout the human body filling every living cell and tissue and linking all organs and parts of the body. Energy is the basis of all life and a vital factor in healing. The object of this form of holistic treatment is to induce a state of balance and harmony throughout the entire body and promote the harmonious flow of energies within. Reflexology works as the pressure techniques applied to the feet or hands interact as a part of the body's nervous system creating relaxation, improved circulation, exercise of the nervous system and the benefits of touch. Pressure sensors in the feet and hands are a part of the body's reflexive response that makes possible the "fight or flight" reaction to danger. The perception of pressure by the feet and hands taps into the reflex network that makes possible our every move. Reflexology, consistently applied, provides an exercise of these pressure sensors and thus a conditioning of the internal organs to which they are inextricably tied. The inside curves of the foot correspond to the curves of the spine with the toe being the top of the spine and the back of the heal corresponding to the sacrum. When the back of the heel is worn down on a person’s shoe, this is an indication that they might have sciatic pain. The tips of each toe represent the head area- specifically the brain. The big toe represents the brain and all the glands the head contains. Sometimes when women wear high heels, they squish the toes which, in turn, decreases the blood flow to the head and gives the person a headache. The second and third toes correspond to the ears, eyes, and sinuses. The balls of the feet correspond to the chest and lungs. The heart rests in the center between the balls of the feet. The arch of the foot corresponds to the internal organs. The kidney (the very center of the foot) and bladder points (just before the heel and on the inside edge of the foot) are more centrally located. This is often a tender area. The intestines surround the kidney and bladder and comprise most of the arch. The beginning of the heal corresponds to the upper part of the pelvic area. The inner line of the foot from toe to heel corresponds to the spine. The outer line of the foot from little toe to heel corresponds to the arm, shoulder, hip leg, knee, and lower back. The ankle corresponds to the pelvic and reproductive organs. The Achilles’ tendon corresponds to the female reproductive organs or prostate. Massage this from the foot towards the heart to guide the blood and lymph back to the heart. Reflexology sessions last from 30 minutes to 90 minutes. The feet are soaked in a relaxing foot bath with essential oils. The client sits in a reclining chair or massage table. The reflexologist uses pressure, stretch and movement to work through the foot methodically. Technique is applied to the whole foot and in some sessions the hands and ears. Sit back and relax. 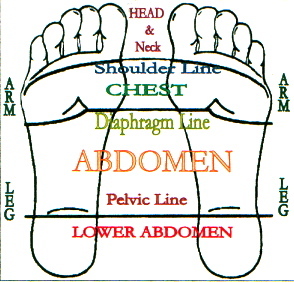 Or, ask for an on-going assessment of stress cues of the feet, the location of reflex areas of the feet, or how to apply self-reflexology techniques. You should feel relaxed at the end of a session. How long that relaxation lasts is a good indicator of the effectiveness of the session. Make note of this and tell your reflexologist your response to the session at the next session. This can be helpful information to the reflexologist. Expect the reflexologist's application of technique to be within your comfort zone- not too heavy and not too light but at a level within your personal preference. Communicate this preference to the reflexologist. That depends on your problem. Also, some people respond more quickly than others. 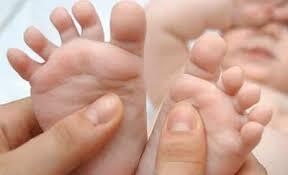 In general, several sessions are required, usually on a weekly basis, to see the benefits of reflexology. Sometimes the patient will have what is called a Healing Crisis. This may occur as the body’s natural healing mechanisms remove accumulated or stagnated toxins from the body. Can I do a treatment on myself? Literally hundreds of reflexology studies have been conducted. A survey of 170 studies showed a positive result for 83% of areas researched. A Chinese survey of 8,096 case studies noted a 94% effective or significantly effective rate. Significant areas of study include: stress and anxiety; lessening of pain and cancer care; as well as health concerns for individuals of all ages. 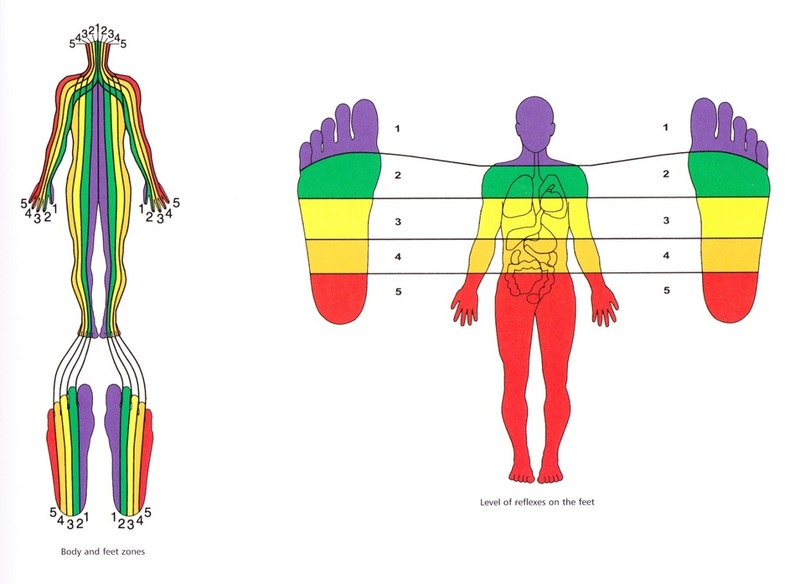 Some Reflexology charts don’t match up perfectly to one another, but this doesn’t matter. What matters is that you pay attention to the tender points of the feet and massage them gently and consistently until those tender points go away. The greater the tenderness of the point, the greater the imbalance in that associated organ of the body. Hard skin, corns, bunions, and infections can all be interpreted by the reflexologist as external manifestations of problems in the corresponding zone or area of the body. These tender areas should receive extra attention and time. An adept practitioner will watch for any reactions of pain or tenderness and vary the pressure accordingly. Reflexologists believe that granular accumulations of waste matter called uric acid crystals concentrate around reflex points. With some training, you can feel these accumulations. The goal is to break these accumulations down in order to open energy pathways to improve the blood supply to the reflex organs. Reflexology also opens blocked nerve pathways and helps to flush toxins out of the body. Since there are over 7,200 nerve endings in each foot, the feet are one of the best body parts to do reflexology on because they are the most sensitive and the most responsive. Alternating pressure on the various points has therapeutic effects. Reflexology is both a science and an art. ﻿Reflexology yields the best results when it is done with dedication, patience, focused intention and loving care.﻿ This is not a technique to be rushed. Precautions: Avoid reflexology in the first three months of pregnancy. Tell your practitioner what medications you are on. Because the body will detoxify faster, certain medications may not work as well because they are being carried out of the system faster. Besides being effective in treating disease, Reflexology is an extremely effective therapy in cases of stress, tension, and fatigue, and has been proven effective in cleansing the body of toxins, increasing circulation, assisting in weight loss, and improving the overall health of different areas throughout the human body. Let’s admit it -we all love a good foot rub! Over time, reflexology has developed a more scientific background based on our ever increasing knowledge of anatomy and physiology which has resulted in its acceptance into conventional, orthodox medicine as a rapidly growing therapy worldwide. People of all ages, shapes, and sizes can benefit from this highly therapeutic foot massage. Shanti often teaches Reflexology courses for couples, adults, and children: Click here for Upcoming Events and Workshops.